It’s not always easy to improve your google rankings, the competition is tough and hundreds of web pages are competing for one of the places in the top of the Google SERPS. Nevertheless, this does not mean that it’s not possible. With the right approach and mindset, you can improve your rankings and increase your organic traffic. Implement it and then watch your rankings increase. What is difficult is to come up with an SEO strategy that will actually work and produce good results and this is exactly the purpose of this post. Before getting into the details on how to create an action plan that will help you rank higher on Google, it is necessary to understand the importance of doing so. The process requires a lot of work and patience and from my experience if you don’t have the necessary motivation, it will be very difficult to dedicate the necessary effort to implement your plan correctly. Motivation in this case will come from the benefits you can gain by achieving higher rankings and this alone is enough to empower you to take the necessary actions. Think for a moment what would be the benefits to your business if you could improve the google rankings for some of your important keywords. Increase in targeted organic traffic – this is by far the most valuable source of traffic a website can have. Increase in sales and conversions. Increase in social visibility – Users are more likely to share a webpage they found in the first pages of Google with their followers. Increase in email subscribers (if you are not into email marketing yet, then it’s time to consider this very seriously). Increase in Google trust – If Google trusts your website and gives you a higher ranking for some keywords (even if they are not very competitive), this is a good sign that what you are doing is in the right direction. So now that we are all motivated, let’s see how to create an action plan to make this happen. No plan is complete without having clearly defined measurable goals so the first step is to identify what you want to achieve. 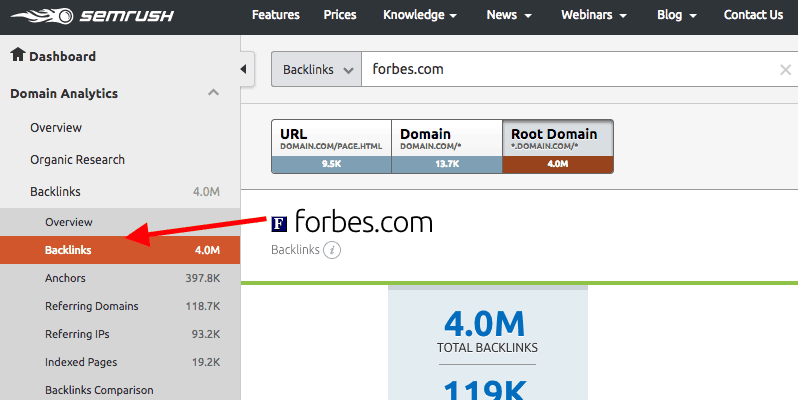 Creating a ranking report to find out which keywords currently bring organic traffic to your website. You need to do this to fully understand your current position and then enrich it with more data to come up with your final targets. 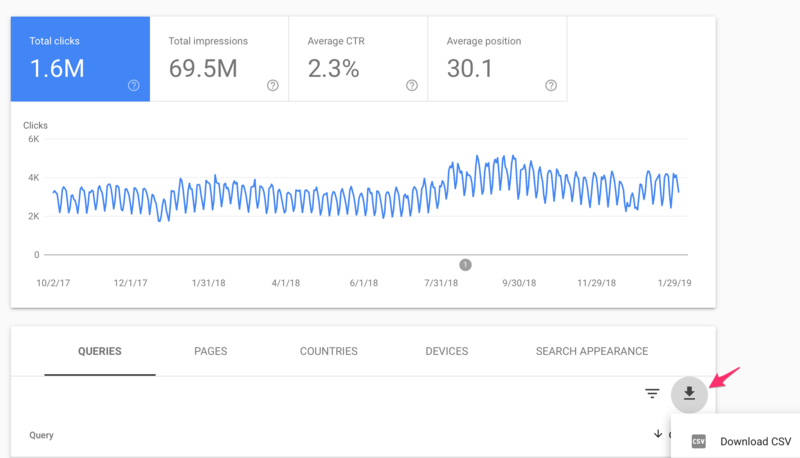 Login to your Google Search Console and click on ‘Performance’ from the left menu. Set the date range on top (3 months is good). Click on the DOWNLOAD button and select Google Docs as the Download Format (you can also select CSV but Google Docs format is faster since you don’t have to re-import the data in Excel). There are various tools to help you keep track of your ranking positions and you can use whichever you want. I use 2 paid tools for my websites (and client websites): The first one is serpbook and the other one is Semrush (used in this post). Login to Semrush and create a new project (click the + next to projects). Enter your domain details and add a name for your project. Go back to your rankings sheet (downloaded from Google Search Console) and copy the keywords over. Note: Before copying the keywords you can apply some filtering so that you don’t track more keywords than necessary and increase your monthly cost for maintaining a ranking report. Remove brand type keywords (i.e. your domain name) from the list. Track only keywords that appear up to page 3 of Google i.e. positions 1 – 29. At this stage there is no point in having all keywords that your website appears. We will enrich the report in the steps below. So far you have created a ranking report that includes keywords that currently bring Google traffic to your website. The next step is to perform keyword research to find out which keywords can potentially increase your organic traffic and define your rankings goals. These are the keywords that you already have a ranking (either on page 1 or page 2 of Google) and also have a decent monthly search volume. The idea is simple: if you can increase the rankings of those keywords, your traffic will also increase. Look at your ranking report more closely and try to spot keywords that meet the above criteria. 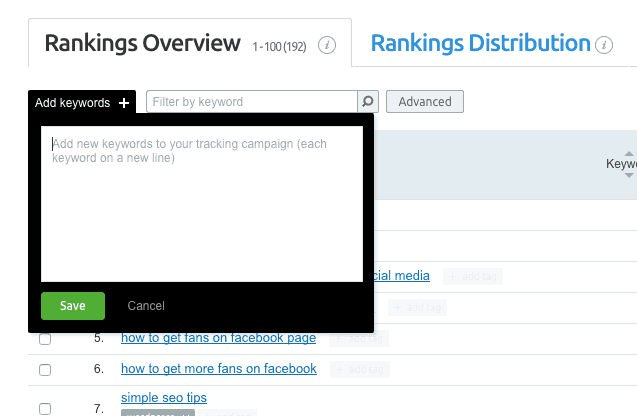 Hint: You can sort your ranking report by monthly search volume and look at your ranking positions. Besides looking at the keywords you already have a good ranking, you also need to identify other keywords that can bring you more Google traffic. 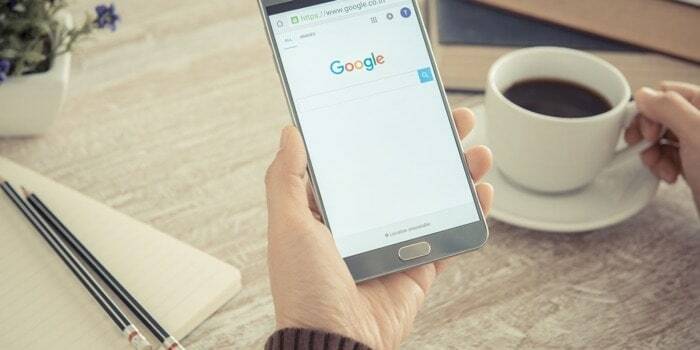 You can either use the Google keyword tool to do your research, I have many examples in my SEO Course and also in this article or you can use a new feature of SemRush called ‘SEO Keyword Magic’. The beauty of ‘SEO Keyword Magic’ is that is helps you find keywords that meet the 4 criteria above in a very easy and fast way. For example, let’s assume that you have a fitness blog and looking to find more keywords to target. You already have a lot of articles that relate to ‘how to lose weight’ and you want to find out more potential keywords. What you can do is type your keyword in SEO Keyword magic and then apply some filters. In the example below I have defined that I want keywords that have a search volume of 50 (at least) and a keyword difficulty of less than 80%. Note: Keyword Difficulty is a percentage calculated by semrush that indicates how easy or difficult a keyword is based on a number of factors. The lower the value, the easier is to target that keyword. If you scroll down the list, you will see a lot of keywords that are easy to target and can potentially improve your google rankings and generate more traffic for your website. 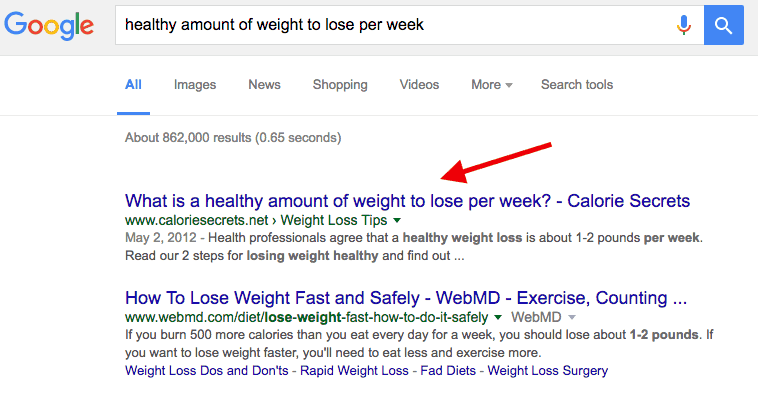 I did the same exercise in the past and have selected to target “healthy amount of weight to lose per week” and if you check the SERPS, you will see that I’m ranking on position 1 for this keyword. After you complete your keyword research go back to your ranking report (created in Step 1) and add the new keywords. We have created a ranking report that includes both the keywords that can increase traffic in the short term (these are the keywords that you already have a ranking in pages 1 and 2 of Google) and we also keywords that are easy to target with new content. Now that you have a clear idea about your targets, the next step is to analyze your competitors i.e. the websites that already have a higher ranking for your keywords and think about your competitive advantage. The purpose of this step is to make you think how you can make your content better and provide a better experience to users compared to what is already available because this is exactly what Google wants. At this stage we only care about the content these pages have but at a later step we will also deal with their link profile. Once you gather all this information it’s time for you to evaluate how your web site and content compares with the rest. What about your web site structure? Do you miss anything in the content that they have? Prepare your answers and let’s see below how these can be transformed into actions. Almost all of your above findings have to do with on-page SEO. Things like page titles and descriptions, content length, h1 headings and images are elements that are part of what we call on-page SEO. Remember that we have to deal with 2 separate cases. Second to create new pages to target keywords that we don’t have a ranking. Review your SEO and make sure that your technical SEO is correct and optimized. 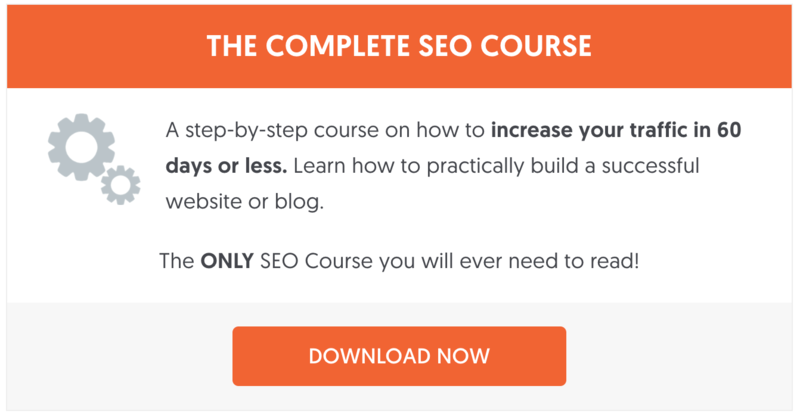 My SEO Audit article has all the details and steps to follow. Review your titles and H1 headings and make sure that they include your target keywords (or variations). 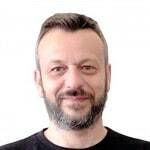 See my SEO Tips article for practical examples. Review the content to ensure that it’s up-to-date and does not have any broken links. If necessary, add new content to make the page more interesting. Review your content length and make sure that it meets the average content length of the pages that already have a good ranking (use the data gathered in Step 3). Reply to any pending comments and remove any approved comments that are spam or do not add any value to the page. If not already in place, implement schema markup and optimize for Google featured snippets. Add those page in your sidebar (you can name the section ‘Must Read’ or ‘Recommend Reading’ – see my sidebar as an example). Revise your web page design: If you have outdated images replace them with new ones. Ensure that your font is readable and that there is enough white space in page to make reading easier. If not already in place, make sure that you indicate clearly the author of the page and any sources referenced in the content. If you are on WordPress, I suggest you also review WordPress SEO Best Practices to ensure that your theme and plugins are SEO friendly and don’t create any problems with your rankings. Group similar keywords together – Group your keywords together and decide for which of those keywords you want to create separate pages. The SEO Keyword magic tool has already done this for you (look for the keyword groups on the left). 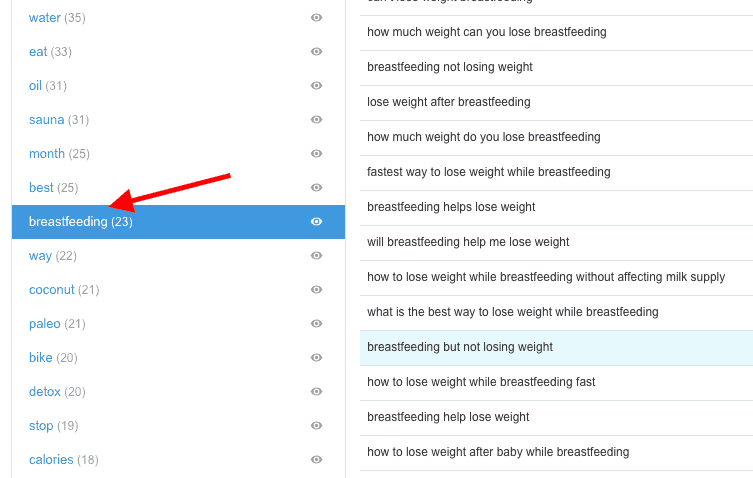 For example, if you click on the ‘breastfeeding’ group you will see that all related keywords are grouped together. To avoid content duplication and publishing multiple pages about the exact same topic, you can create one new page per group. If you take a closer look, all the suggested keywords of the breastfeeding group refer to similar topics so you can create an in-depth article to cover these in detail. Create a publishing calendar – Once you have identified what you will write about, the next step is to create a content publishing calendar. Various studies have clearly shown that websites that are updated regularly are more likely to increase their rankings compared to websites that don’t follow a consistent publishing schedule. Your content publishing calendar should include the title of the article and the scheduled publishing date. Once you have this in place all you have to do is follow your plan and watch your traffics and rankings increase. We have a clear view on how we get google traffic (through our ranking report). We have revised our existing pages and on-page SEO. What big factor is missing from the above plan that can make a difference in rankings? 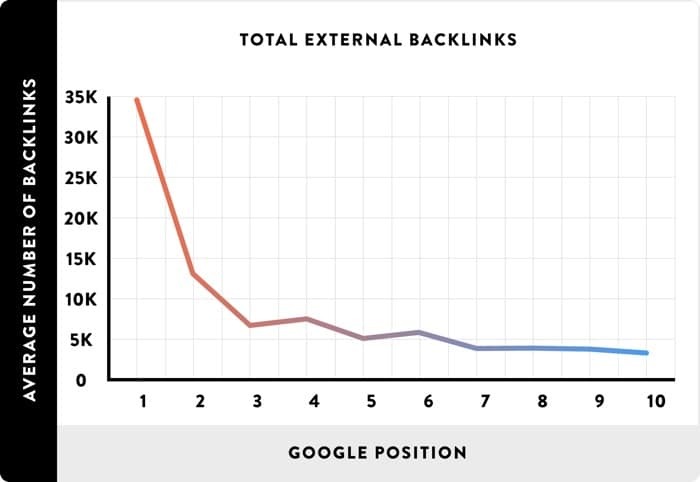 You guessed it correctly, it’s backlinks. Websites that have incoming links from other websites on the Internet seem to be more important and useful for users and thus they deserve a higher ranking in the Google SERPS. This is an idea that is still valid today. Links are considered by SEO’s and research studies as one of the most important factors that can have a big impact on rankings. How to create a link building strategy? While links are good, it should be made clear that not all links are equal. Bad links can do more damage to your website and may be the cause of getting a Google penalty (which means that your rankings will drop). What you need is natural links. In simple terms a ‘natural link’ is a link that is added by a website owner because it adds value to their content and improves the user experience. For example, let’s say you are reading an article in Forbes that talks about the best gaming laptops. It is natural and expected in that article to have links pointing to different laptop manufacturers so that users can find out more about a model reviewed in the list. On the other hand, if you are reading an article about ‘SEO’ it’s not natural to have links pointing to a website that deals with ‘forex trading’. It’s unrelated and does not help the user at all. Link building is a complicated and time consuming task so before getting into the implementation part you need to come up with a link building strategy. Google’s algorithm is clever enough to identify patterns with links. This means that it’s not a good practice to build too many links at once. This will raise a signal in the algorithm that something is not right. For example, if you are trying to improve the ranking of a page that has a few links pointing to it since it was first created and in a month that number doubles, then this may create the opposite result. Only go after links that matter and can make a difference. Link building is not a numbers game i.e. it’s not the website with the greater number of links that ranks high in the SERPS but the website with the most quality links. A quality link comes from a related website that has a high Google trust. What to include in your link building strategy? Your link building strategy should include a list of websites that are good candidates to get a link and the frequency you will create those links. The idea here is to find out which websites are already linking to your competitors and approach them so that they can also link to yours. There are many tools you can use to do a back link analysis, I like to use semrush because it’s very easy to use (and I already pay a subscription for it for the other useful features it has). As you can see in the screenshot below, you can type in a domain and find out exactly how many links they have and from where these links are coming. Your task at this point is to try and get in touch with the website owners and send them a personalized message (either by email or social media) and tell them in simple words what is the benefit for their users if they also link to your content. For example, if in your content you have a graph that explains something better than your competitor’s websites, mention this in your email. The key point here is to use personalized messages and not something general for all. I receive hundreds of such emails per month and I only read those that are personal and specific to my websites and content. I like this technique because it’s very easy to do and it works. The idea is that you reference other websites from your content, the web owner will see the links in their analytics account (as referral traffic) and they may return the favor. One of the reasons that this technique works is that webmasters (including me), check on a daily basis our referral traffic to see from where it’s coming and if we see a new referral domain we will check the website out to find out what they are saying about us. If it’s something we like we may return the favor in a new post. Surprisingly enough, this is also a technique suggested by Google as explained in one of their guides on how to engage with your audience and increase your traffic (screenshot below). The take home message of this article is that it is possible to increase your Google rankings without taking any risks or violating any Google guidelines. Remember that usually people don’t go back to improve their existing content so by doing so you already have an advantage over your competitors. Your first step is to understand for which keywords you have a good Google ranking and identify which pages can increase your traffic in the short term. Next, you need to do your keyword research to discover new keyword opportunities that can get you more visits in the long term. Then you need to analyze competitor’s web pages that already have a better ranking and try to think how you can make your pages better through on-page SEO and content upgrades. Finally, once you are certain that your page is better than the rest, you can create a link building strategy to gradually increase your rankings by building solid and quality links to your website. Anything else missing that can help someone improve their google rankings without taking any risks? Can i know which theme is best for seo? Read the first section of this: https://www.reliablesoft.net/best-wordpress-seo-practices/ where I cover what to look for in an SEO Theme. I was surprised to see that you recommend linking to a website, that you hope will link back to your site. Doesn’t that appear to Google, that you may have just traded links with the webmaster of the other site?. This is not considered link exchange but natural link building, according to Google. Here is the link to the full guide: http://services.google.com/fh/files/misc/adsenseaudienceengagement.pdf Read page 22 in particular. As mentioned in the article, this is a method that actually works since webmasters tend to check their referral traffic and sometime they do return the ‘favour’. Thanks for this informative post… I’ll start to work on this stratergy. Great ways to improve Google rankings. Page speed is very important. It is one of the most important factors to get good ranking on major search engines. All the points you mentioned are very important but I would like to ad one more point to the list that is adding social login. It improves the registration process by simplifying the whole process and drive more traffic to the website. Indirectly, anything you can do for usability it’s also good for SEO.